Precious arrived to Back to Nature in July 2011 when she was just 3 weeks old. She was found in an open field at Green Meadows Farm in Kissimmee, Florida. She had 2 visible puncture wounds on her back that were suggested to be from a bird of prey attack. After several months of rehabilitation and recurring health issues, Precious took a fall. She fell from a branch and injured her hip during play time with some fellow raccoon friends. It was at that time discovered that Precious was not healing as well as we had hoped. According to X-rays, she had muscular atrophy in her front arms. This was likely caused by the initial attack from the raptor grabbing and then dropping her. Because of this permanent physical impairment (which would limit her ability to escape from a predator or properly climb] she was deemed non-releasable by our vet of record and approved by FWC to serve as an “educational ambassador” for her species. *Precious loves to splash in her water and soak her food before eating it. The raccoon is a medium-sized mammal native to North America. The raccoon is the largest of the procyonid family, having a body length of 16 to 28 in and a body weight of 8 to 20 lb. Its grayish coat mostly consists of dense underfur which insulates against cold weather. 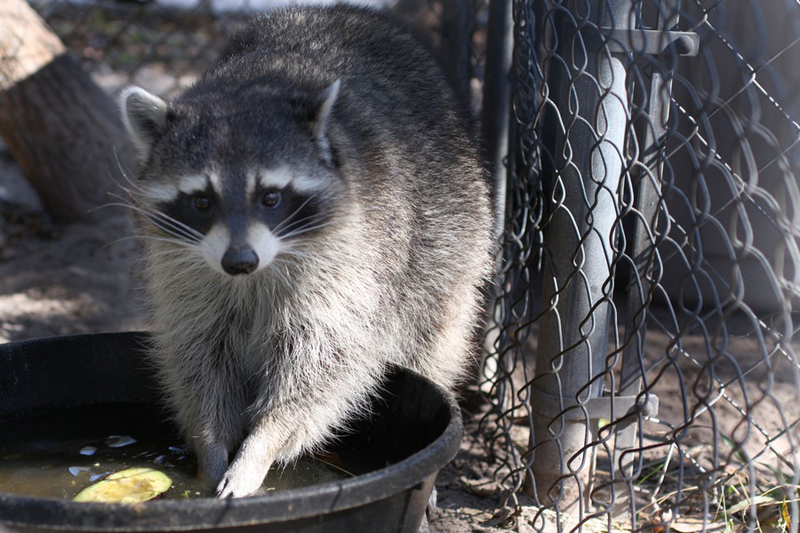 Two of the raccoon’s most distinctive features are its extremely dexterous front paws and its facial mask. Raccoons are noted for their intelligence, with studies showing that they are able to remember the solution to tasks for up to three years. The diet of the omnivorous raccoon, which is usually nocturnal, consists of about 40% invertebrates, 33% plant foods, and 27% vertebrates. 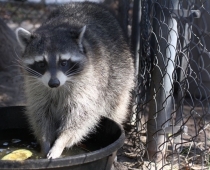 The original habitats of the raccoon are deciduous and mixed forests, but due to their adaptability they have extended their range to mountainous areas, coastal marshes, and urban areas. Home range sizes vary anywhere from 7 acres for females in cities to 20 sq mi for males in prairies. After a period of about 65 days, two to five young, known as “kits”, are born in spring. The kits are subsequently raised by their mother until dispersion in late fall.